I get a lot of questions from founders (and some investors) on term sheets. I have seen quite a few founders accept onerous terms without really understanding the implications. While this is a pretty detailed topic I have attempted to make a concise guide to explain what some of the major terms to focus on are. Term sheets are not binding (unless they specifically say so) except for the exclusivity provision which restricts founders from negotiating with other investors for a certain period (usually 30–60 days) after signing the term sheet. The term sheet is followed by a more detailed shareholders agreement which is binding and enforceable. This guide aims to provide a brief overview of what some of the major terms mean, and what is usually the ‘standard’. I would still advise that a lawyer is engaged to ensure that the language of the document accurately captures the arrangement. Equity investment means the investor is investing money in the company for a fixed percentage of shares. Debt means borrowed money which will have to be repaid. A convertible note is debt that converts into equity upon the occurrence of a trigger event – usually a subsequent round of funding. In any investment, negotiations focus on whether the term/issue being discussed pertains to economics or control. Economics refers to the terms that relate to financial returns that the investors and founders will get in various scenarios. Control refers to terms that restrict or affect the founders ability to take decisions and requires the founder(s) to obtain the investor’s consent before taking certain decisions. All other terms are not worth spending too much time over unless they affect the economics or control provisions. Pre-money the value of the company before the investment is made. 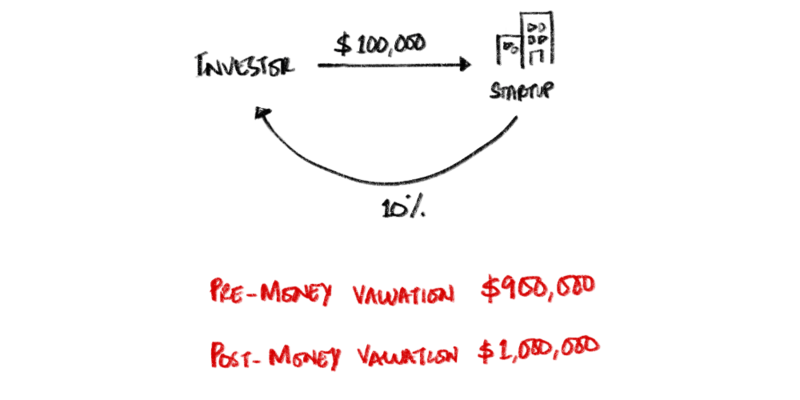 Post-money the value of the company after the investment is made. An investment offer of $5 million at a valuation of $20 million could mean that the investor is seeking 25% equity if the valuation is pre-money and 20% equity if the valuation of the company is post-money. It is important to understand the difference between the two when negotiating valuation. Essentially a liquidation preference gives the investor a right to take out money before any other shareholder in a liquidation or an exit event. In the above scenario, the Investor invested $150,000 in the startup for 10% with a 1x participating liquidation preference. At an exit event, the investor will first receive the $150,000 and the remaining amount would then be distributed amongst the shareholders in proportion to their shares. In the event the Investor had a non-participating preference, she would be entitled to the higher of the amount invested ($150,000) or value of the 10% of the sum the company is being acquired for ($215,000). While there are different kinds of liquidation preference, the two important concepts to understand are participating and non-participating liquidation preference. In a participating preference (illustration above), the Investor first has the right to receive a multiple of the amount invested (typically 1x, anything more is onerous) and then shares the remaining amount pro rata with the other shareholders. In a non-participating preference, the investor gets the higher of a multiple of the amount invested (typically 1x) or the pro-rata share of the amount for which the company is being acquired for. Given the high risk associated with startup financing, a lot of investors in MENA & Pakistan opt for a participating 1x liquidation preference. However, in more advanced markets (and some for some investors in MENA & Pakistan), the norm is non-participating 1x liquidation preference. The Employee Stock Option Program (ESOP) is set up to give certain employees an option to buy shares of the company at a certain (subsidised) price within a particular time. The objective is to incentivise certain employees with shares which in future could be very valuable. Depending on the nature of the business and the number of employees that may need to be incentivised, investors can require the founders to set aside anywhere between 5%–20% for the ESOP from the founders’ equity. It is important to discuss the ESOP when negotiating the term sheet to ensure both parties are aligned. The objective of this provision is to protect the investors in the event of a ‘down round’ i.e. a fundraising round where the company has been valued lower than the previous round. Formula for the broad based weighted average anti-dilution provision. A broad-based weighted average anti-dilution is standard. It is calculated in accordance with the formula given above. Another kind of anti dilution provision which a founder needs to be wary of is the full ratchet. In a full ratchet, the existing investor’s investment converts at the valuation of the company in the down round. This results in the investor getting more equity than she initially did. Since an early stage venture investment is essentially an investment in the team, the investors are keen to ensure that the founders earn their equity over a period of 3–4 years. Typically there is a cliff (e.g. a 12 month period after which the founder gets 1/3 or 1/4 of her equity) followed by monthly/quarterly periods over which the remaining equity is earned. Board of Directors run the company. All strategic decisions are made by the board. The CEO (who handles day to day operations) is appointed by the board. All major authorisations are given by the board. Investors typically ask for a board seat. That is normal. Voting in the board is on a majority basis. Some investors ask for more than one board seat. As long as the founders have a majority, they will retain control of the company. Given investors in an early stage venture investment take a minority equity stake, it is important for them to protect their investment. Reserve matters are a list of matters that can only be done with the consent of the investor. Most of these matters are focused on limiting the founders ability to take cash out of the business (except for what has been agreed is required for the business) and any alteration of the rights attached to the shares held by the investors. Founders must ensure that while the concept of reserve matters is reasonable, some items in the list may not be reasonable. Certain matters that may make it difficult for the founders to operate the business must be negotiated. This is another term to carefully evaluate. These exit provisions are typically used to protect shareholder rights. Tag along allows a party (usually a minority shareholder) to ‘tag’ along with the other shareholder in the event the other shareholder is selling her shares to a third party. What this means is that the other shareholder will have to ensure that the third party also buys the shares of the party with the tag right for the same price. In the event the third party cannot buy all of the shares then they can either sell proportionately or there is no sale at all. The investors usually keep a tag along right to prevent the situation where the founders sell the company to a third party and leave. Some founders also ask for such right to be reciprocated. This right is not onerous as no one can be forced or compelled to sell. Drag along on the other hand can be onerous. Drag along right allows the party to force the other shareholders to sell their shares at either a price agreed between the parties or at the price being offered by a third party. It is very important to negotiate and fully understand such a clause as it could give another party a right to sell the founders’ equity. This article was first published here and has been reproduced on MENAbytes with author’s permission. Update: The ‘Liquidation Preference’ part of the article was updated (by the author) to include more details. An independent legal practitioner with a demonstrated history of working with the technology industry. Co-founder of Pakistan-based Wukla, a Pakistan-based legal contract automation platform. Mubariz can be reached on Twitter.